Chick Lit Central: Waking up in Vegas with a book giveaway! We have a couple of treats for you today! One of our associate reviewers, Gail Allison, is here to talk about why she "hearts" Las Vegas. 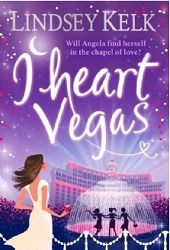 And Lindsey Kelk, care of HarperCollins UK, has FIVE copies of her upcoming novel, "I Heart Vegas," to share with some lucky readers anywhere in the world! It will be available on December 8th, so take a gamble you can't lose and make sure to buy yourself an early holiday treat (if you don't win a copy here first). You can even pre-order it for your Kindle! You know that tingly feeling that starts in your fingertips and runs straight down your spine when you know something wonderful is about to happen to you? Your face gets warmer, you can’t help grinning like an idiot, and you want to high-five whoever is sitting next to you. You’re inclined to raise your glass to anything at all, and the least little bit of good news makes you want to break into applause and cheers. And that feeling is exponentially multiplied when you know everyone around you is feeling the exact same way. The air crackles with excitement that practically lights up the inside of the airplane. Welcome to a flight landing in Las Vegas. I’m not kidding. What other town can boast long-term headliners ranging from Frank Sinatra to Elvis Presley to Garth Brooks? Where else can you find mega-casinos with real live lions in the lobby? I saw two grown men shoot each other in the face in Las Vegas and they both lived!! (Admittedly, they were Penn and Teller, and it was part of their magic act at the Rio, but still!) I defy you to find me anywhere else in the world that I can (for a price, of course) head outside to the dolphin pools to be a dolphin trainer for the day, wander over and check out the white tigers when I’m done, and finish up with a four star dinner, all within minutes of each other. Oh…and then go dancing (with a very real chance of a celebrity sighting) at one of the upscale nightclubs nearby. And then bungee jump off the top of a hotel just up the street. Just another day in Vegas. That being said, it’s probably not for everyone. My mom, for one, doesn’t seem to be impressed by the glittery façade of the strip (although I still wonder if she’d be more impressed if I hadn’t come home a few years ago from Vegas proudly sporting my first tattoo). But I still maintain that if she just took a deep breath and plunged headfirst into the glitz, she’d be awed. There’s really nothing else you can be when your plane is landing in the middle of the desert at night, and all you can see is the shimmering strip cutting through the middle of the city. The sheer magnitude of the strip is breathtaking. Last time I was in Vegas, my husband and I were down there with a friend. Just to give you a sense of how wonderfully, ridiculously grandiose the properties are there, I decided that we could easily walk down to Caesar’s Palace for breakfast (What? Serendipity 3 is there! I had to! The frozen hot chocolate was calling to me!). We were staying at Treasure Island. The only hotel between the two is the Mirage, and they’re all on the same side of the street. The stroll from TI to Caesar’s took us fifteen minutes. I’m not kidding. FIFTEEN minutes to leave one hotel, go past another, and into the next one. Yes, we are all still on speaking terms, but if breakfast hadn’t been so incredibly delicious, it might not have turned out so well. Everything is bigger and shinier and just a little more dazzling in Vegas for no reason other than “we wanted it like this, so we made it like this”. Oh...and it’s hot there. Being from a city where winter runs from October to March (at the very least), the heat is a big kicker for me. The fact that I was walking around in flip-flops and capri pants last time I was there (mid-October) practically made me giddy. That we got to drink from the world’s largest margarita may or may not have contributed to the giddiness. I can’t really say. I guess I’ll have to go back again just to make sure, right? And that’s why I heart Vegas. We are thankful to Gail for sharing her thoughts about Vegas with us and to Lindsey and HarperCollins for sharing "I Heart Vegas" with our readers! 2. What is your favorite Vegas themed movie, song or TV show? 3. Have you ever gambled (playing the lottery does count)? What are your thoughts on gambling? Please make sure to include your e-mail address or another way we can find you if you win! Open worldwide! Giveaway ends December 4th at midnight EST. 3) Yes but tend to fall asleep if I do it for too long. 3 - I only gamble in love ! This has my name all over it . I am going to win ! You can do whatever you want no matter what time it is. Time completely stands still there. What is your favorite Vegas themed movie, song or TV show? - I never was in Vegas cause Russia is pretty far away from it but when i think about this city i am immediately think about Friends' episode when Rachell and Ross got married in Vegas =D Best episode ever! plus i love "What Happens in Vegas"
3. Yeh, why not, you're in Vegas, Gambling city, so why not. You wouldn't complain if you won! My favourire part about Vegas was how it made me feel like a star. The bright lights made me feel glamourous and special. I loved most seeing Dean Martin and Frank Sinatra's stars in front of the Flamingo as well as the Venetian Hotel. It was absolutely breathtaking! I DEFINITELY heart Vegas. As someone living in the UK I have been to Vegas for the last 8 years running and have stayed in 10 different hotels in that time. I already have my next trip in January booked and cannot wait. Seeing as I work for a Bookmakers (Gambling) in the UK you would think I would like to gamble in the Casinos but I havent once put a Cent in any machine or geot involved in anything else that would take my money. My only vice is shopping and Vegas has plenty of it and thats why I come back time and time again. My favourite thing by far about Vegas has to be the hotels. No matter how much you try and explain to people what they are like inside and out nothing can compare to seeing them yourself. My favourite by far exteriorwise has to be New York New York and for someone thats been there it gives you a little smile to see The Statue of Liberty take pride of place outside. As for interior I dont think you can beat the Gondolas and St Marks Square in The Venetian - Again undescribeable and something everyone should witness themselves. Could literally go on all day about the different things that make me go back year after year but that would take too much time and im guessing peeps are bored of me already! My favorite thing about Vegas is actually that my parents are OBSESSED with it! They go on several mini-vacations to Vegas a year, and seem to do more than I would do with my friends there! Haha. Good for them! Now maybe one of these days they'll decide to take me along...! 1. The first thing I would do once getting to Las Vegas would be to find the tallest building, find my way up as high as I could and take in the view! I'm a sucka for a skyline, even a bright, sparkling one! 3. Only ever gambled with my heart unless you count the 2p machines at the arcades gambling. Think if you have the money then its up to you, but never put yourself at risk. It should always be about fun. 1. My favourite thing about Vegas are the Bellagio fountains, because it was the first 'touristy' thing that myself and my friends saw when we arrived and it was the start of an epic holiday. 2. Not strictly Vegas themed but the first song that I think of when I think of Vegas is Heartbreak Hotel by Elvis.. mainly because of the amount of Elvis impersonators in Vegas! 3. I have played the lottery and won £10. I had probably invested more than £10 prior to winning, however it definately gave me hope that one day I will actually win the jackpot. I think that as long as you know you're limits, gambling can be quite fun.. and I definately enjoyed spending my £10 on a nice bottle of wine with my friends that night!! 2)It has to be Oceans 11 who wouldn't want George clooney, Brad Pitt,Matt Damon AND Julia Roberts in one movie trying to rob a casino in Vegas? 3)Yes I have gambled before...I enjoy beating complete strangers in texas hold em poker on facebook just to get the satisfaction of winning and I also play the lottery regularly to try and win an fair amount of money so i can fund my clothing obsession. My favorite thing about Vegas is the atmosphere. I love that place there's something about the over the top appearance of the place. I usually go once a year. I want to go see Cirque du Soleil. Yes and I won $6000 playing poker! AWESOME GIVEAWAY!I heart NY,Hollywood and Paris and sure heart Vegas and would love to have a copy. Read the other three books (they are even translated here in my part of the world!!! wooohoo) and LOVED them. 2. Not just my fav Vegas song, but one of my all-time favorites - VIVA LAS VEGAS ELVIS PRESLEY. That song rules! 3. I have and I enjoy it, but I don't do it often. If I went to Las Vegas, I'd love to go to a casino and try the slot machines. Paints a crazy and wild picture of Vegas, with a hint of luxury. Anything can happen in Vegas... "What happens in Vegas, stays in Vegas"
1) Never been to Vegas before but if I were to, I'd visit the Caesar's Palace! Such a lovely place! At least it is on the telly screen! 2) Favourite song of Vegas is Waking Up In Vegas by Katy Perry! My favourite song of 2009! 3) The thrill you get from gambling! It's very addictive too! But never done it properly before, only played games on Facebook. I hate losing all my money! I have never been to Vegas but I would love to visit a Cirque du Soleil show there. I hear they are amazing. 1. I love the bright lights and glitz of Vegas. 2. I always watched Las Vegas when it was on a couple years ago. 3. Only play slots. Only in Vegas. I don't want to start with the convenience of going to Indian casinos. I don't have that much money. People should not gamble more than they can afford to lose. I would want to go see a concert first. Well my favorite thing would be the Luxor. I love anything Egyptian and on my last trip to Vegas they actually had not finished it so I never got to see it. It would be number one on my list. Well, I just got back from Vegas, so how can I not comment to win a book about one of my favorite places to vacation. 1. In Vegas I like taking in the shows. 3. I have only gambled once and that was in NC not even in Vegas. It was in a group setting and that worked is why. Otherwise not really my thing. I like that in Las Vegas there is always something to do. 1. The themed hotels- they are awesome, so huge and surreal it is untrue and the Bellagio fountains - unreal! 2. Oceans 11 - I love that movie and Viva La Vegas by Elvis Presley immediately springs to mind. 3. As for gambling - there is a time and place for everything and what happens in Vegas stays in Vegas! Love that sound of your book! 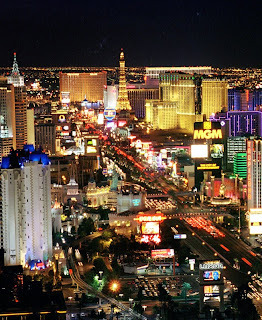 I'm hoping to go to Vegas in May to do some research for a chick lit book I want to write there. Well, that's my excuse for a fab holiday, anyway! 1. Cruise the whole strip - OK, so may need to take some plasters for my tootsies! 3. Yes, and won, too! I stopped then, I was too chicken to carry on. My favorite Vegas-based movie is The Hangover! I have never been to Vegas - some of my kids have. I want to go so bad just to experience the 'bigness' of it all. The first thing I would do would be to just walk down the strip and take it all in. My favorite Vegas-themed movie is Fear and Loathing in Las Vegas. 2. My favorite Vegas themed movie is The Hangover!! Favorite movie is the Hangover by far! My favorite Vegas themed movie would be Oceans 11 too. But I found "Pride and Prejudice 2003" quite funny too, and there is a short Vegas sequence in the end. I've never been to Vegas but the first thing im going to do when i do eventually get there is go and see one of the big 'superstar' shows. Barry Manilow and Celine Dion may be cheesy here but i think they fit perfectly with Vegas, and i reckon with the amount of money they get paid to do these residencies, it would be one hell of a show! 1)Ive never been but would love to see and visit all the themed hotels especially want to see the dancing fountains at the Bellagio. 3)I live in the UK and we have a huge horse race here called the Grand National. Have a bet every year and I have done at other horse & groundhound race meetings. I can see how people get hooked on winning. Never so good when you loose though. I have been there once and like all the excitement! I do like to do slots occassionally but am not a big gambler. 1. What is your favorite thing about Vegas? I would love looking at all the amazing hotels. 2. What is your favorite Vegas themed movie, song or TV show? The Hangover!! 3. Have you ever gambled (playing the lottery does count)? What are your thoughts on gambling? Play the lottery occasionaly. Would love to win so think gambling can be a good thing. Because I love hotels (part of my major was hospitality) I would have to visit the following hotels: The Venetian, The Bellagio, Mirage, Mandalay Bay, Paris Las Vegas, Harrah's, Luxor and MGM Grand! My favorite thing about Vegas is the shopping! I love it! Also you just never know what's going to happen in Vegas!! 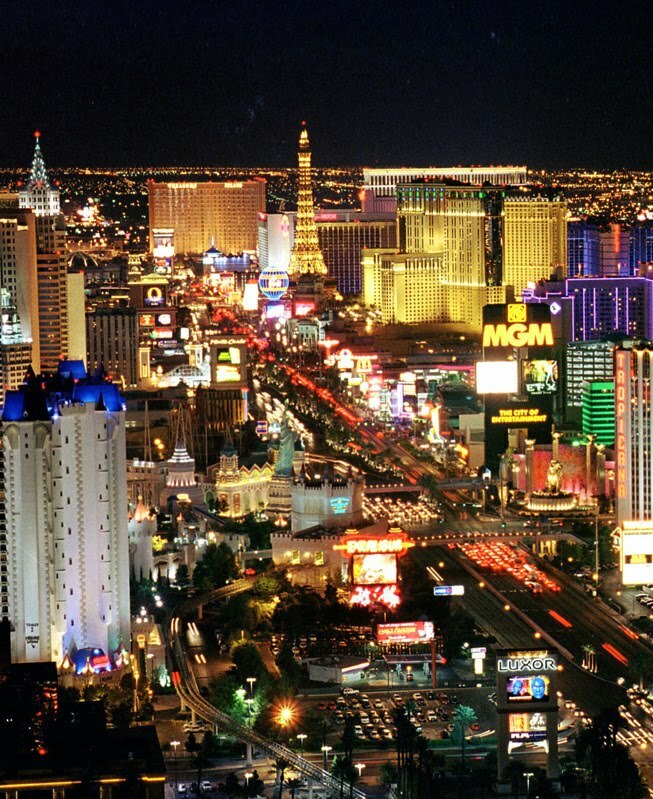 1. i have never been to Vegas, alwaysssssss wanted to! The first thing I'd probably do if I got there would be update my twitter and fb :/ then go see Celine Dion at Caesers Palace! 2. My favorite Vegasy song would have to be, river deep mountain high, yeah yeah yeahhhhhh. 3. I've only ever bought one scratchcard in my life and I won a fiver! If you want to gamble do it, you only live once, your own loss and fault if you lose! I play poker with friends but not for money, for prizes (mainly chocolate!) My advice - don't gamble if you have a remotely addictive personality! my favourite film based on vegas is what happens in vegas! its such a cute chick flick and makes it look an amazing place! 2) Fave movie/show would have to be the Friends episode where Ross & Rachel get married. And The Hangover could also make my list. 3) I usally only gamble when in Vegas and don`t go hard-core, but enjoy the time I spend doing it! Especially if I`m up!! It has got to be sister act when the nuns are running through the casino!!! Ocean's Eleven is by far my favorite Vegas-themed movie. That I got married there, that I was able to go back the most recent time with my best friend and show her the place where I got married and feel real closure on the aforementioned marriage. While it was me who ended the relationship several years down the line (hey we got married there for "family politics" and I had just lost my Mum so it was less painful to be Over There to do it) and some people felt that I did not need closure, nor deserve it, somehow it worked. Watching a musical in one of the hotels and about halfway through I started to cry silently and just felt refreshed. Vegas is certainly healing and that's despite the fact that I had already given up drinking before the 1st time I was ever there. I think gambling is fine in moderation, and that you know when to quit. My husband plays the lottery but he only spends a set amount. I grew up working in a bingo (I went to Catholic School and the money went right back to the church and school. I earned pretty good money! and I had fun too!) I have only been to a casino twice and I had a blast playing the slot machines. I love this book series!! !